I moved to Florida in 1979. My first trip to Disney World was before that. My father was living in Florida and I visited him and he took my son and I to Disney. We rode the boat from the parking lot to the main theme park area. Back then there were choices as to how you wanted to travel after parking. I think it was between the monorail and the boat. The boat took a lot longer and I think that’s why it didn’t last. People are in a hurry. Also back then the tickets were sold as A through E tickets. Each one was good for certain rides only. 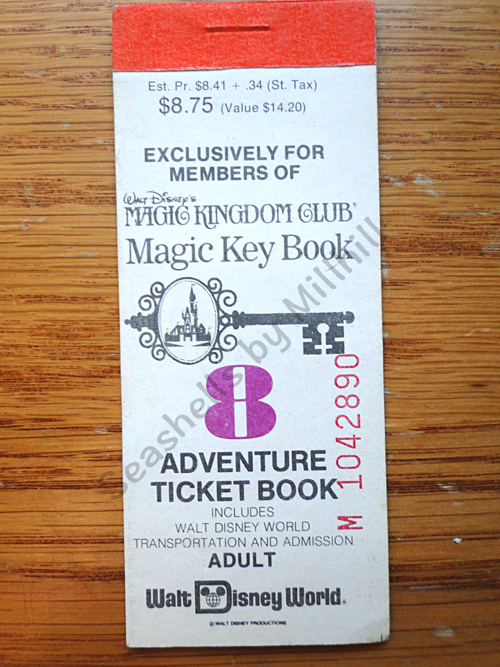 Or we could buy the Adventure Ticket Book, which held Magic Key Coupons (seen here in my photos – yes, I still have this coupon book). 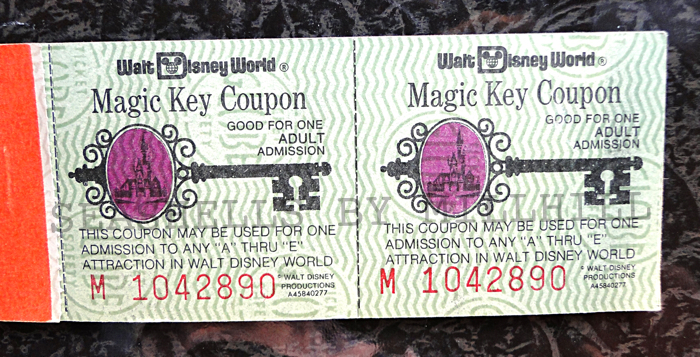 Each coupon was good for one adult admission to any “A” thru “E” attraction. Like the good old days of narrow back roads running across the peaceful Florida landscape, a fun-old fashioned – and affordable – day at Disney is no more. As you can see, the $8.41 plus tax price tag didn’t last long. When I lived in Florida each year we saw the news that the ticket prices to visit Disney had gone up. I just read an article at Frommers about how the price has now jumped to over $100 for a single ticket. The article asks the question, “Are Disney vacations only for the rich?” At those prices, I definitely say, YES. Besides paying to park, buying food and drink all day long, and paying $100 per person to spend a day dealing with crowds in the hot Florida sun, Disney is looking very unattractive to me. I say let the wealthy tourists keep it going. Prices will not get better, only worse. It makes me feel sad for the many families who will never have the chance to show their kids Disney World. So is the high price of tickets a good way to weed out the poor? To make sure that your Disney trip is spent rubbing elbows with the affluent? Or is it necessary to keep visitor count down? I dislike all of this. It’s why my favorite Florida spot is the beach, or better yet, my backyard pool. I remember the days of the old rides, like the Gondola ride that carried guests across the park high above the crowds. The claustrophobic 20,000 Leagues Under the Sea was quite unique, and not all that impressive as I recall, except for the concept. And Discovery Island that was too much like the Zoo to fit in with the excitement of a day at Disney. I have an idea for those who can’t stomach the idea of spending hundreds of dollars to run around a theme park or two. Take a more affordable, and less stressful, vacation and see the real Florida. Stay in historic St. Augustine, or rent a house on the beach. Visit the Keys and go snorkeling. Those are the types of vacations I like to write about here on my blog. Yeah, as a kid my lower middle class family was able to go to Disney several times. Gone are those days! So sad. Yup, I think it’s sad too. It’s tough to tell kids they can’t go to a place that is advertised everywhere as a beautiful and fun place for them.